At Harlequin’s Gardens, we have been experimenting for years with bulbs in our display gardens. Since our gardens are xeriscapes (by default even where not by design), we have had the pleasure of discovering that a great many delightful bulbs can thrive and naturalize in our conditions and enliven the scene in spring and fall. 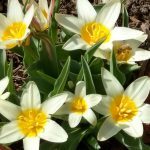 No surprise, really, since most of these hardy spring and autumn-blooming bulbs originated in parts of the world with conditions much like ours, such as Central Asia. Visitors to our gardens have been wowed by enormous Star of Persia Alliums and brilliant sapphire miniature iris, and charmed by perky miniature daffodils and starry species tulips and crocus. 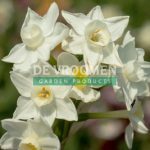 They (you) kept asking us “where can I get these?”, so in 2008, we carefully selected our first-ever offering of bulbs for sale at Harlequin’s Gardens. Since then, we have added more than 30 wonderful varieties. The bulb list below may change from year to year. Of the varieties listed, we expect to receive most in early- September, the rest in mid to late September. Quantities are limited and may sell out quickly. 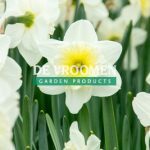 We recommend that you purchase your bulbs in September and hold them for planting when the soil is cooler (except Saffron Crocus and Crocus speciosus, which should be planted as soon as possible). Planting depths are to the bottom of the planting hole where the base of the bulb rests. Planting depth can vary depending on how light or heavy your soil is – plant deeper in light soils, shallower in heavier soils. 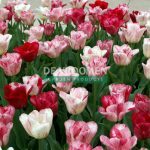 Single Early, Triumph, Darwin Hybrid, and Multi-flowering tulips should be planted 8″ deep to perform as perennials, and fertilized each year just after bloom. Be sure to allow the leaves and stems to wither naturally before cutting them down. Here are some ideas for ways and places to use bulbs that you may not have thought of. One idea is to plant small early-blooming bulbs, such as many of the species tulips, where the ground is exposed in spring but will be covered in summer by spreading herbaceous perennials like Desert Four-O’Clock (Mirabilis multiflora), ‘Orange Carpet’ California Fuschia (Zauschneria garrettii), or Wine Cups (Callirhoe involucrata). Also, meadows and drifts of ornamental grasses are usually dormant until mid to late spring, and present a perfect stage for a brilliant display of many types of early spring bulbs. Deciduous groundcovers that emerge in mid-spring, like Plumbago (Ceratostigma plumbaginoides), can partner nicely with Iris reticulata and small species tulips. Shallots are aromatic and flavorful, yet smoother and sweeter than Onions or Garlic, and act as a catalyst in recipes, subtly enhancing other flavors. They are mild and delicate when cooked. If onions are at all upsetting to your stomach, you’ll find Shallots much easier to digest and less sharp smelling, both raw and cooked. Shallots are easy to grow, and each set produces a whole cluster of bulbs. ‘Holland Red’ delivers mellow, quintessential Shallot flavor in a plump, round bulb with coppery-red skins that peel easily, and purple-tinged white flesh with reddish-purple inner rings. A super-productive variety and an excellent keeper that can be braided and hung in your kitchen or pantry. They keep this way for up to 1 year! 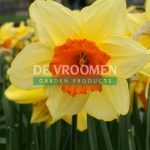 ‘Holland Yellow’ provides most of the same qualities, but has white flesh and tan-yellow skins.Grow in full sun, spaced 4-6” apart in rich loamy soil. Cold-hardy to Zone 3. Dense, four-inch diameter globes of starry red-purple florets atop stems up to 24” to 36” tall. Very showy, and the earliest large-flowered ornamental onions, blooming in mid-spring. Thrives in full sun to part-shade, and naturalizes by self-sowing. Stunning, long-lasting cut-flower. The dry seed-heads are also highly ornamental in the garden and in flower arrangements. Grow amid perennials that will mound over the foliage when it has dried, such as Saponaria ‘Max Frei’, or among tall, ‘architectural’ perennials such as ‘Moonshine’ Yarrow. Alliums are resistant to browsing by deer and rabbits. Plant 6-8″ deep, 6-12″ apart. Zone 4. 18”-36” tall. Inch-and-a-half globes of gorgeous true-blue flowers are borne abundantly atop 12” – 18” stems in May and June. 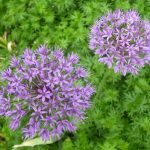 Native to Siberia, this easy-to-grow flowering onion is very accommodating, and will grow in sun or part-shade almost anywhere, including xeriscape gardens and at high elevations. 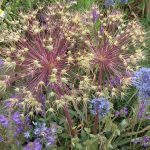 Dry seed-heads are also attractive in the garden and in dry bouquets, but this flower re-seeds readily, so if you want to maintain population control we recommend dead-heading. Looks great planted with Aquilegia chrysantha (Denver Gold Columbine), Pineleaf Penstemon, or Malva moschuta ‘Alba’. Plant 3″ deep, 2″-4″ apart. 12’-18” tall, Late Spring, Summer (May-June), hardy to Zone 3. A most surprising, outrageous flower for xeriscapes! The giant globes, to 10” diameter or more, are held on fairly short stems, 8” – 18” tall, blooming in mid-spring. The hundreds of starry, silver-lavender florets each have a green ‘eye’ are arranged so that their petal-tips touch to form a perfect sphere. This easy naturalizer has been highly successful in our xeriscape display gardens, eliciting lots of interest. Also spectacular in large flower arrangements, fresh or dried. Deer and rabbit resistant, and very drought-tolerant. If you don’t want it to naturalize, dead-head before the seeds mature. Zone 4. 14”- 24” tall. Plant 6” – 8” deep and 8” – 10” apart. Circa 1857, this delicate-looking yet easy-growing North American native has composite 3″ globes of star-shaped, sparkling white flowers with pale lavender stamens tipped with purple anthers and sturdy stems. Bloom time: May/June. 12″ to 16″ tall. Zone 4-8. A lively mix of various hardy, medium size Allium blooms for the late spring garden. White and various shades of purple ball shaped blooms sit atop tall stems. Alliums offer wonderful nectar sources for bees of all kinds. Zone 5. For best results plant bulbs in groups of at least 6. A fascinating and subtly beautiful flowering onion with a 5” umbrella-shaped inflorescence made up of pendant ¾” plum, green and white bells that come spilling out of an elegant pointed white papery sheath atop a tall stem. The flowers are richly endowed with nectar and are eagerly visited by honeybees. After pollination, each individual flower stem slowly turns upright, until the whole cluster is erect. Both the fresh flowers and dried seedpods make outstanding cut-flowers. The long strappy blue-green leaves twist in a spiral, and are a garlicky edible treat, traditionally ground up with salt, dried, then sprinkled on tomatoes or salads. Moderate water, to 18” – 36” tall. Full sun. Hardy to zone 5. Plant 6″ deep, 6″ apart. Allium rosenbachianum holds large purple globes, like Spanish exclamation points, atop sturdy 24-36”-tall stems. This hard-to-find heirloom variety has been in cultivation since around 1894. Blooming two weeks ahead of the other large Allium, they’ll extend your enjoyment of one of our most unique hardy garden flowers. They will also make the early bees and other pollinators very happy! Plant these Allium in groups of at least three in a sunny to part-shade location in enriched, well-drained soil. 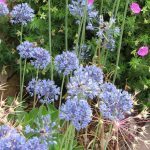 They work well planted in a perennial bed where the perennials or grasses will grow in and cover the allium’s aging foliage. They make great cut flowers too! Easy-to grow, they are drought tolerant, deer and rabbit resistant and are nearly pest and disease free. Their spectacular architecturalpresence in the flower garden is unmatched by any other early-blooming perennial! Hardy to Zone 4. 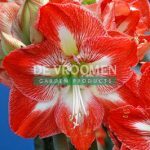 The full petals of this bright and stylish Amaryllis are a saturated red, overlaid with a white star and accented by stippled veining and a light green throat. 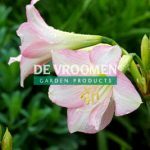 This lovely pale pink amaryllis blooms from a small size, with even offsets blooming in its second year. 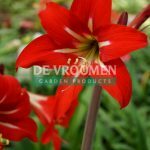 These bulbs are smaller than standard amaryllis, but fully capable of blooming their first year. Produces 7-8 blooms per stem. Makes a very full display in a pot. 20” tall. A gorgeous, bright red flower with wide petals. A perfect holiday decoration! An enchanting, early-blooming member of the Buttercup family that grows from a tuber. Where happy, it spreads to form a carpet-like groundcover with ferny deep green foliage and 1”- wide open-faced sky-blue daisy flowers with yellow eyes. Provides a long-lasting display in early spring. Works well under daffodils and tulips, in rock gardens, or in masses under deciduous shrubs and trees. Prefers a humus-rich soil, average moisture and good drainage in a sunny or partly shaded location. Hardy to Zone 5, 3-4” tall. 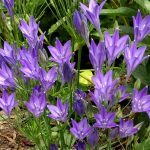 A wonderful Western US native wildflower bulb valued for its clusters of violet-blue, upward-facing flowers. ‘Queen Fabiola’ is lovely companion for relatively short perennials that bloom in May and June, like ‘Coral Canyon’ Twinspur or ‘Elfin Pink’ Beardtongue. It also makes a long lasting and graceful cut flower. The dark green foliage is slender and grass-like. ‘Queen Fabiola’ is easy to grow in full sun or morning sun and well-drained soil. Late Spring, Early Summer bloom. Hardy to Zone 5A. 6-12” tall. 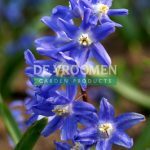 Blue Glory of the Snow is a deer proof bulb with compact 6-8” spikes of cheerful, white eyed, bright blue flowers in early spring. Chionodoxa is very attractive when planted in large drifts of many bulbs, and naturalizes readily. Plant in full sun or morning sun, 2-4” deep, 16 bulbs per sq. ft. or 4” apart. Cold hardy to Zone 3. One of the fall bloomers, these heirloom Colchicum are the tallest and most free-flowering of the genus, each corm producing up to 10 big funnel-shaped flowers from 10” to 12” tall. Along with Cyclamen, they are must-haves for the autumn garden. 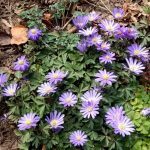 Anywhere from late August into November, without warning come 4-6″ crocus flowers of pink with a pale lilac throats – Surprise! They are fabulous coming up through mid-height groundcovers like Plumbago (Ceratostigma plumbaginoides) The following spring, the wide glossy leaves appear, growing vigorously until mid-spring. A quick multiplier, they are great under shrubs or in any neglected area of the garden in dappled shade to full sun. Cold-hardy to Zone 4. The presumed wild progenitor of the Saffron Crocus, the domesticated triploid Crocus sativus. It probably appeared first in Crete. The lovely flowers, in shades of lilac with deep purple veins and prominent red stigmas, appear with the leaves in autumn (October-November). It differs from almost all other Crocus in that C. cartwrightianus remains open at night. It shares the striking red three-parted stigma and the delicious scent of the cultivated Saffron Crocus, but differs in being smaller (2-3” tall), being fertile (C. sativus is a sterile triploid clone) and not needing frequent division in order to keep producing blooms over the years. Its great distinction, besides hardiness, that really sets it apart from C. sativus, is its bunch-flowering habit. Each corm will produce three to ten blooms and will naturalize easily. The stigmas provide a wonderful dye, but don’t have as much flavor as Saffron Crocus. Plant in full sun, in well-draining, fertile, alkaline soil. Cold-hardy to Zone 5. A cheerful mix of many colors and forms of super-early ‘snow crocus’! Hardy to Zone 3. 2-4” tall. This lovely fragrant variety has a subtle beauty that’s unusual in this colorful genus, with luminous flowers, soft-blue on the outside, pearly white inside with a bronzy gold base and deep yellow throat. Inside the cup, a burst of orange stigmas nestle deep in a yellow center, invisible until the flowers are fully open. Awarded the RHS Award of Garden Merit in 1993, Blue Pearl is considered one of the finest, vigorous, reliable and long-blooming of the early spring ‘snow crocus’. Grow in sun, morning sun, or light shade. It will naturalize easily to form large clumps. Hardy to Zone 3. A classic ‘Snow Crocus’, in late winter the heirloom variety ‘E.P. Bowles’ produces dainty, fragrant, sunny yellow blossoms marked with bronze streaks at the bases of the outer petals. Goblet-shaped when closed, the bronze markings can be enjoyed, and in bright sun the blooms open wide into cheery cups revealing gold/orange anthers and stigmas. The short grassy green leaves emerge with the flowers and go dormant by late spring. Crocus chrysanthus is native to S.E. Europe and Turkey, and naturalizes freely in friable, well-drained soil, in a location that’s in full sun during their bloom time. It’s easy to grow and long-lived. Group this little beauty in rock gardens, mixed borders, alpine troughs, or turfgrass. Plants often self-sow. This crocus is also good for forcing in pots. Plant the corms at a depth 2 to 3 times the height of the corm. Cold-hardy to Zone 3. 2-3” tall. 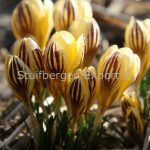 This wild “snow” crocus bears sweetly fragrant, bright golden yellow goblet-formed flowers with striking deep purple stripes on the outer petals. The blooms appear in February/March. Fuscotinctus grows well in gritty, poor to moderately fertile, well-drained soil, dry to moderately moist. Perfect for naturalizing in any sunny or partly sunny location or lawn, and are also charming in pots. 3-4″ tall. Plant 4″ deep. Hardy to Zone 3. 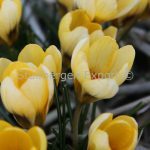 Crocus chrysanthus ‘Gipsy Girl’ is an especially strong-growing variety of ‘snow crocus’ that multiplies well in the garden or pot. These flamboyant little flowers have all the striking qualities of a gipsy skirt, their relatively large golden yellow blooms being marked on the outside petals with a stylized design of deep red feathering looking like delicate brushwork. 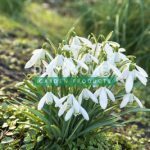 Plant Gipsy Girl in a sunny spot in beds, lawns, rock gardens, along pathways or under deciduous shrubs for a vibrant and dramatic early spring display. Cold-hardy to Zone 3. 2-3” tall. These sensational Steppe plants will be the highlight of your garden. Every year, the clumps grow larger with more dramatic stalks of yellow flowers resembling fox tails. Bees love them, and they make good cut flowers. Soak the dry, brittle roots in water before planting. Plant 5” deep and 8-10” apart in well-drained, amended garden soil in full sun. Moderate to low water. Deer and rabbit resistant. Low maintenance. Zone 5. Pendant, bell-shaped white flowers with green-tipped petals are a classic harbinger of spring. They look wonderful planted in groups and may bloom as early as February. Commonly called snowdrop, this bulbous perennial is native to Europe and southwestern Asia. It will naturalize where happy. thrives in rich garden loam in part shade, making it perfect under deciduous trees and shrubs. Zone 3, 3” tall. 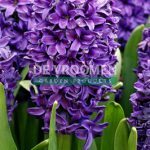 All of these highly fragrant Dutch Hyacinth varieties are perfect for spring gardens and for forcing indoors in pots or hyacinth glasses. They are long-lived in the garden if fertilized after blooming, and after the first year they will produce more flower spikes that are less densely packed and more natural-looking. 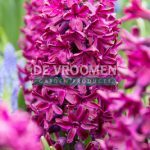 Hyacinths are very easy to grow in a sunny or partly shaded spot. A spring gem for dry or moderately watered gardens in shade and part-shade. 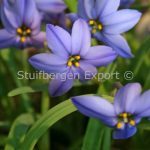 This long-blooming bulb from Chile and Uruguay sends up a mound of grassy foliage in autumn that persists over winter and begins blooming in early spring, producing a long succession of sweetly fragrant, dark blue flowers (the darkest of all the Ipheion) through late spring, each atop its own 3” – 6” stem. Multiplies to form a groundcover until summer when the foliage goes dormant. Also lovely planted under taller mid-spring bulbs such as ‘Tete a Tete’ miniature daffodils. 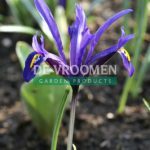 Succeeds in a wide range of soils, but like most bulbs, requires reasonably good drainage. A member of the Onion family, the foliage smells like garlic when crushed (which makes it resistant to deer and rabbits!). Plant 3-5″ deep, 3-4″ apart. Hardy to Zone 5. 3-5″ tall. 3-5” tall. Blooming in late winter/early spring, this brilliant canary yellow blossoms with flecks of brown on the falls requires a sunny site with well-drained soil. Plant 4″ apart and 3″ deep. 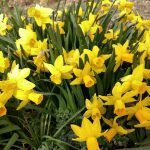 To provide nourishment for the bulb, it is important to allow the grassy foliage to yellow and dry after the flowers are spent before pruning. Hardy to Zone 3. New fragrant dwarf species. Soft sky-blue flowers with pale yellow markings on the falls appear before the leaves. Perfect to add color to your garden at the end of winter. Alida multiplies very rapidly in the garden and is one of the earliest bulbs to flower. Suitable for rock gardens or garden borders. Blooming very early, along with species crocus, these miniature irises are brilliant harbingers of spring. They are best for naturalizing in the rock garden or flower border, and increase vigorously. The flowers, though brief, are like richly-colored jewels, and are spectacular when planted in large drifts. Blooms are followed by attractive, erect, dark green, narrow foliage. Prefers humus-rich soil, good drainage, and moderate to low water. Natives of Asia Minor. Iris standards are the inner petals that stand upright, and the falls are the outer petals that open downward. Hardy to Zone 4. 4” -8” tall. Deer-resistant. Plant 4” deep and 4-5” apart. A classic old variety from 1938, purple with reddish purple falls; one of the latest to bloom. J.S. Dyt is very small, fragrant, and perfect for rock gardens, deciduous woodlands, fronts of borders or rock gardens. Performs well in all typed of soil as long as it is well-drained. Blooms late winter to early spring. Grows 4″-8″ tall. Hardy to Zone 3. Native to rocky hillsides from SW and Central Asia (Syria to Afghanistan), this lovely wildflower in the Amaryllis family bears umbels of starry violet-blue flowers with darker midveins above grass-like foliage for 3 to 4 weeks in late May and early June. 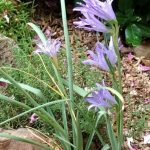 Perfect for the well-drained xeriscape garden, this delightful bulb will thrive in a dry, sunny spot where it receives some spring moisture, followed by hot, dry conditions in summer, and will self-sow and naturalize where it’s happy. Some added bonuses are its resistance to browsing by deer and rabbits and its great performance as a cut flower. Hardy to Zone 5. 10” – 16” tall. Deer-proof! Plant 5” deep, 4” apart. 5-8” tall, Blooming for several weeks in early-mid spring, this plump, sky-blue grape hyacinth, with its pyramid of little bell-shaped florets more rounded than most species Muscari and a little top-knot of sterile florets forms quite a remarkable species that deserved its RHS Award of Garden Merit. It has a sweet grape fragrance. 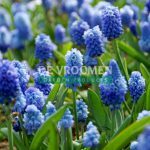 Muscari naturalize well and increase rapidly, forming beautiful sweeps of color. They are very easy to grow, tolerating full sun, shade, and drought. Foliage often begins to appear in autumn, remains through the winter, and more of the grassy foliage begins to grow in early spring. 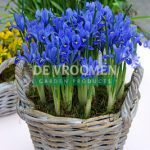 The bright sky-blue flowers of M. azureum mix beautifully with flowers of almost any other color. Hardy to Zone 4. This very floriferous 1930 Heirloom tazetta hybrid should be planted where you’ll notice and enjoy its strong and heavenly perfume. 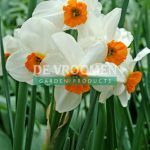 The late-midseason blooms have a dainty orange-red cups surrounded by large pure white petals and the bulbs produce many out-facing flowers on each 14”-16” stem and increase well, making a striking display and provide wonderful fragrant cut flowers. Zone 4-5. Deer and rodent-proof. Plant 6-8″ deep, 6-8″ apart. Double, golden Daffodil blooms illuminate the mid spring garden. 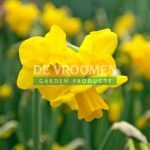 This wonderfully fragrant heirloom daffodil has large, long-lasting flowers with multiple layers of brilliant yellow-gold petals on sturdy stems. 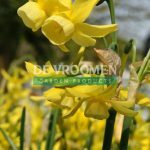 Golden Ducat is very adaptable, a good naturalizer and performs well even in warmer zones. Makes a splendid cut flower. Hardy to Zone 2.Deer and rodent-proof. 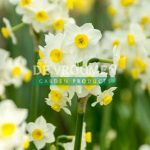 This 1938 Heirloom hybrid triandrus-type miniature daffodil provides a long-lasting display of many little elfin, light lemon – yellow nodding bells with short demitasse cups and swept back petals. Each 5-6” slender stem bears one or two of these dainty blooms with wonderful, fruity fragrance. 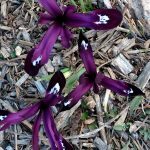 It is one of the most adaptable, and seems to thrive in partial shade or full sun, growing beautifully forced in pots, shining and thriving growing in scree or dryer areas as well as in the garden border. Blooming in mid-late spring (May), it contrasts nicely with grape hyacinths and is exquisite with hellebores. The very slender foliage is easy to hide while it matures. Hardy to Zone 3-4. Deer and rodent-proof. 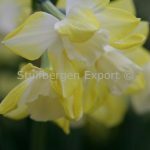 Enormously popular, Ice Follies has become a classic daffodil. 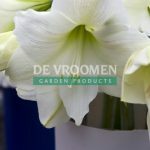 This sturdy award-winner bears huge 4” flowers with white petals surrounding a frilled, very wide-open, sunny yellow cup that gradually matures almost pure white. A prolific multiplier, it naturalizes vigorously and is a long-lived perennial. Fantastic in large drifts. Also a good forcer. Plant in full sun or morning sun/afternoon shade, in average garden soil with moderate water. 16-18” tall, early-mid spring, hardy to Zone 3, plant 6-8″ deep, 6-8″ apart, deer and rodent-proof. An old favorite for naturalizing, and another Cyclamineus daffodil. Bright and cheerful in the garden, with reflexed vivid yellow petals and orange-red trumpet. ‘Jetfire’ is early blooming, and increases rapidly to form showy colonies. Very long-blooming, tough and adaptable. Also good for forcing indoors. Plant 3 times height of bulb, 4-6″ apart. Zone 3, 8” – 10” tall, Deer and rodent-proof! Narcissus poeticus ‘Pheasant’s Eye’ is a very old heirloom variety. 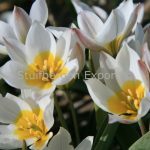 The wonderfully fragrant blooms have large, star-shaped, reflexed white petals and a small, yellow, red-edged cup with a green eye. The wildflower blooms are both eye-catching and delicate. Blooms in late spring. Zone 3, 14-16” tall. Deer and rodent-proof. 6” tall. This winner of the RHS Award of Garden Merit has extremely fragrant, soft yellow flowers that stand out against the narrow, dark green tubular foliage for an eye-catching display in mid-spring. Each stem can produce 4-5 blossoms. As the flowers mature, the dainty trumpet-shaped cups turn ivory white. ‘Pipit’ is vigorous, will multiply rapidly and can be left undisturbed for years. Plant it where its wonderful fragrance can be enjoyed! It also makes a great cut flower for small arrangements. Hardy to Zone 4. Plant 4″ apart. Deer and rodent-proof. 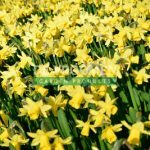 Floriferous, sweetly fragrant and long-blooming, this outstanding naturalizing daffodil bears two to four golden-yellow flowers per 12” – 14” stem in mid-spring, and increases rapidly to form drifts. The dark green leaves are narrow and reed-like, and easy to hide in the garden while they mature. 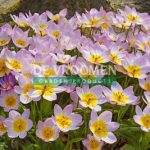 ‘Quail’ is a beautiful companion for Tulipa bakeri ‘Lilac Wonder’. Plant in full sun or part shade. Zone 4. 12-14″ tall. Planting depth: 3 x height of bulb, 4-6″ apart. Deer and rodent-proof. One of the best heirloom award-winning Cyclamineus daffodils, we have grown this miniature variety in our Xeriscape Rock Garden for many years. 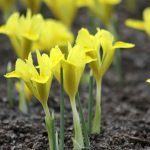 The graceful, floriferous early-bloomer has a reflexed, buttercup-yellow perianth surrounding a trumpet-like, darker yellow cup. For naturalizing, rock gardens, border plantings, and forcing. Hardy to Zone 4, 6” – 7” tall, Deer and rodent-proof! Plant 6” deep, 3-6″ apart. Potted Paperwhites bring intoxicating fragrance to your home in winter, and make wonderful holiday gifts. Bears trusses of heavily-scented, pure white flowers on up to three stems per bulb. They may be planted in all kinds of decorative pots, vases and trays, either in soil or pebbles, September through February. Rodent-proof. Place the bulbs about 1” apart and cover 2/3 of the bulb with stones, marbles or pebbles, or completely cover the bulbs with potting soil. Water, then place them in a light, cool place in indirect sunlight until the foliage stands 3” to 4” high. Move to a sunny location at room temperature and keep them well watered. They will bloom in four to six weeks from planting. If not potting immediately, store bulbs in a dry, dark spot at 50 to 60 degrees Fahrenheit. Also available pre-planted in gift-boxed pots. With its sunny yellow heart and lilac pink petals, the 6”-8” ‘Lilac Wonder’ makes a great companion to mid-spring daffodils like ‘Hawera’, ‘Quail’ and silver leafed plants like Lamb’s Ears, Alyssum oxycarpum, Partridge Feather and Teucrium cossonii ‘Silver Form’. A vigorous grower, it naturalizes well and is useful in xeriscapes as well as rock gardens and traditional bulb borders. Plant in full sun; Lilac Wonder likes to bake in the summer. Hardy to Zone 5. Plant 5-8″ deep, 3-4″ apart. ‘Tinka’s is a selection of the ‘Lady Tulip’, a species native to Afghanistan, Iran, Iraq, Pakistan, and the western Himalayas. 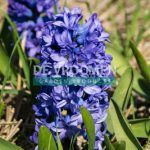 It naturalizes easily and is ideal for mass plantings in sunny, gardens. A striking bi-color flower with rose-red outer petals and creamy-yellow inner petals and dark purple anthers on graceful stems above narrow foliage. The flowers are as attractive closed as they are when open-wide. Blooms mid-late spring. Fertilize annually after bloom and divide clumps every few years for best flowering. Zone 3, 8” tall. This striking bicolor combines shades of warm cinnamon, bronze, plum, orange and rose-pink for a most unusual display. As they mature, the intriguing blooms deepen to a rich caramel color, with a sweet sugary fragrance to match. 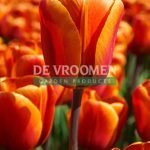 The sturdy stems of Tulip ‘Brown Sugar’ also give them excellent weather resistance. Blooming mid to late spring, its blossom is produced on top of a strong, tall stem. April/May, HZ 3-7. 16-18” tall, mid-spring. This color-changing variety will provide an enchanting spectrum of rosy hues throughout its lifetime. Hemisphere’s petals begin pure white and develop pale rose pink flecks and stripes, which spread and deepen as the flower matures, until the tulip finally reaches an intense rose pink. Semi-flared blooms stand on a contrasting grey-green stem with broad lance-shaped leaves. One of the ‘Triumph’-type tulips, excellent for perennializing, bedding, cut-flowers, or forcing. Pairs perfectly with the almost-black ‘Paul Scherer’ (see below). Hardy to Zone 2. Persian Pearl Wildflower Tulip is uniquely colored with showy purple-red petals and a bright yellow center. 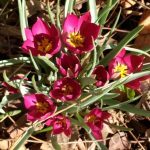 Like most of the wildflower tulips, Tulipa h. ‘Persian Pearl’ multiplies itself readily. Fragrant. Said to be deer-resistant! Early to mid-spring bloom. Full sun to part shade. Thrives in moderate to low-water gardens. A beautiful dwarf early Kaufmanniana tulip, to 6” tall, with multicolored flowers that have an elegant teardrop shape when closed, showing bright golden yellow outer petals with cream edges and flushed brilliant red. When fully open in the sun, the flowers resemble creamy-white waterlilies with bright yellow centers. ‘Johann Strauss’ also has very attractive gray-green foliage with burgundy stripes. Very cold-hardy and adaptable, it will multiply and naturalize, flowering year after year. Plant in full sun, 6” deep and 3-6” apart. Hardy to Zone 3a. 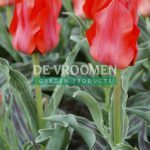 A gorgeous, sturdy, low-growing (8”) naturalizing tulip, perfect for the rock garden, meadow or perennial border. ‘The First’ is very early, blooming in March or April. When closed, the red and white outer petals present a candy-cane striped effect. On sunny days, they open wide (~4″) and look like single waterlilies, revealing an ivory white interior with a bright yellow center and, sometimes, small coral-red markings. Hardy to Zone 3. Plant 6” deep, 6” apart. Zone 3, 4” tall. A species native to the steppes of central Asia. 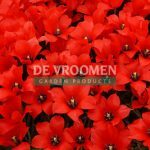 Growing to 8” tall, it sports stunning, bowl-shaped, brilliant scarlet flowers above narrow, wavy, red-margined sword-shaped leaves in mid-spring. Each shiny petal has a black base and a pointed tip. An excellent naturalizer, and a must-have in the naturalistic or rock garden. 3-6″ tall, cold-hardy to Zone 3-4. 16-18” tall. Dramatic purple-black blooms make a bold statement in the mid spring garden. Like most Triumph Tulips, ‘Paul Scherer’ has strong, sturdy stems and looks fabulous cut for spring bouquets. It also perennializes well, blooming year after year if it is not cut and is fertilized after bloom, while the foliage is maturing and feeding the bulb. 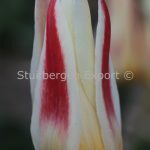 ‘Paul Scherer’ pairs perfectly with ‘Hemisphere’ tulip (see below). Hardy to zone 2. 3-4” tall. 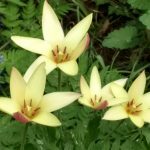 This is a lovely, very early and very hardy miniature wild tulip with up to 5 clustered, yellow-centered, white flowers per stem. The reverse is shaded with grey-green, marked with green and infused with pale pink. The pink increases in intensity with flower maturity. The flower has a light but pervasive violet scent in sunshine. The narrow, strappy leaves are blue-green. This species can be lifted every few years to separate the bulbs if they become crowded. Plant in a fertile, sunny spot in well-drained soil with some added humus. T. polychroma is native from the E. Caucasus, across N. Iran and NW Afghanistan in steppe, semi-desert and mountainous areas up to 9,800’.